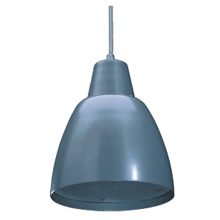 Featuring modern design, canopy included and excellent sound, this sound bowl ceiling loudspeaker consists of powder coated steel-grille fixed with 4 rust free hex socket head screws in order to grant safety and stability. A 2m, 5-core cable and a canopy in RAL 9006 is included in the extent of the delivery. The Sound Bowl is also available as two-way-system. The terrific sound is ensured by the high-grade synthetic membrane with rubber corrugation. Thus the Sound bowl loudspeaker is a result of an innovative development process. High-performance and a wide reflection angle are the features with which this metal speaker fulfills ideally the acoustic sounding of high rooms. With its powder coating in RAL 9006 (white aluminum) this speaker will satisfy a maximum of esthetic demands. COPYRIGHT © 2008 DK SIGNAL LTD. ALL RIGHTS RESERVED.